The demand for identity-based federalism reached its tipping point in May last year when hundreds of thousands took to the streets in Kathmandu and across the Madhes. It was the disagreement over how many and what kind of federal states Nepal should have that obstructed the completion of the new constitution. Ultimately, the Constituent Assembly was dissolved on the night of 28 May and elections were announced. The debate has since been shelved, the streets are quiet, but the battle for the narrative continues. In op-ed pages and social networks, there is extreme polarisation of views. Cyberspace is replete with vitriolic racial slurs from both sides of the debate. On the surface, it may look like a political battle between the NC and UML against the Maoists, Madhesi Morcha, and Janajati groups. But there is a social underbelly to this conflict where class and caste have become intertwined. The dominant discourse portrays the demand for identity as a divisive agenda imposed by outsiders to ignite ethnic tensions in Nepal. Their advocates in the political parties, media, and civil society use the term ‘identity’ and ‘ethnicity’ interchangeably to warn us that recognising either will lead Nepal into ethnic fragmentation. This is a distortion of a well-defined concept that was pre-agreed upon by all political parties in the erstwhile CA's Committee on State Restructuring and Distribution's conceptual report three years ago. ‘The future states must be carved on the basis of identity and economic viability, with special impetus on identity defined as ethnic, linguistic, cultural, regional, historical,’ reads the report. The demand for a Madhes Pradesh in the Tarai has been particularly divisive. The official position of the Madhesi Morcha, partner in the last coalition, has been for an economically viable two-state Madhes Pradesh. This is a climb-down for the Front which had earlier pushed for a single Madhes state. Still, a section of the media blamed the Madhesis for conspiring to ‘Sikkimise’ Nepal, some intellectuals seemed concerned about the economic viability of a two-Madhes model. Economist Bhogendra Jha, who was part of the seven-member State Restructuring Commission told me recently that the two-state model is not just economically viable, but has a good balance of agricultural, forest, and industrial resources. “Those who question it may have political motivations, but there is no economic basis for being against it,” Jha explained. The growing ethnophobia in the country has been bolstered by reported reservations in Beijing and New Delhi conveyed to Maoist Chairman Pushpa Kamal Dahal in the past weeks. He tried to explain that federalism would not destabilise Nepal, but seems to have returned chastised. Polls have shown many Nepalis to be against ethnicity-based federalism. The main fear seems to be that a federal state named after a particular community will make others second-class citizens. 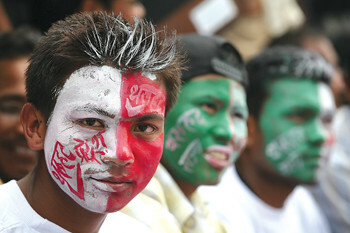 But Nepal’s demographic mosaic does not allow any community to be dominant in any proposed state. Besides, in the absence of front rights, there will be no legal or constitutional basis for obtaining such preferential treatment. Naming a geographic territory after particular communities will be nothing more than a gesture of acknowledging their rich history and culture in the region. But even this need not be mandatory and can be put to vote in those future state assemblies. It is time Nepal redefined nationalism as multi-ethnic diversity and not a monolithic national identity paradigm with one language, dress, and culture. The mainstream view of Madhesi nationalism as being opposed to Nepali nationalism, simply because it rejects pre-determined categories of a Nepali identity also flies in the face of this aspiring inclusive republic. Nepalis have so far lived together peacefully, but that should not be mistaken for harmony. Underneath, there is anger and resentment of a monolithic state apparatus dominated by a few who refuse to devolve. These grievances cannot be wished away.